— MADISON, Wis. — As many here expected, so-called Right-To-Work legislation has come to Wisconsin. Republicans, who control both houses of the legislature, announced on Feb. 20 that they would seek to fast-track a Right-To-Work bill over the following two weeks. It passed both houses of the legislature, and Governor Scott Walker, who had previously called the legislation a “distraction,” signed the bill on March 9, at an invitation-only ceremony at the Badger Meter corporation, north of Milwaukee. The Right-To-Work measure took place immediately and makes Wisconsin the country’s 25th Right-To-Work state. The vote sets a dangerous precedent for other states where reactionary lawmakers are considering introducing similar bills. The introduction of Right-To-Work in Wisconsin follows the same pattern as its passage in Michigan and Indiana in 2012. Both of those states’ governors pretended to be uninterested in Right-To-Work while they sought to woo the votes of socially conservative white workers, but predictably threw working people under the bus once they were securely in office. “Right-To-Work” is a gross misnomer; the legislation attacks unions by prohibiting so-called “fair share” dues, or slightly lower dues paid by workers in a union shop who aren’t full union members but receive the benefits provided by the union. Removing unions’ right to a closed shop divides workers between union and non-union members in the same workplace, weakening the union and making it extremely difficult to organize a strike. Median wages for workers in states with Right-To-Work laws are almost $6000 a year lower than in states without them. Anti-bill rallies organized by the AFL-CIO drew 2000-3000 on Feb. 17 and 18 and about 10,000 on Saturday, Feb. 21. There have also been protests in Milwaukee, Superior, and other cities around the state. Many of those mobilized have been from building trade unions, some of which had strongly supported previous anti-environmental legislation pushed by right-wing legislators and now feel betrayed. The protests have been significantly smaller than in 2011, when hundreds of thousands flooded the streets of Madison and the state capitol to fight union-busting legislation targeting public workers. That legislation eventually passed and has decimated the membership of the state’s public worker unions and the wages and benefits of public workers here. The overall tone of the fightback is pessimistic, reflecting the sense of defeat inflicted on workers here since 2011. Rather than electing to call for a general strike at the time, statewide union leaders instead pushed for a recall election to funnel the energy of the uprising into votes for Democrats. The subsequent recall failed to remove Walker from office. More recently, Walker has openly boasted of defeating massive labor protests, comparing protesters to Islamist terrorists for the benefit of his prospective presidential campaign funders. Private-sector unions could call for a work stoppage to fight the bill, but have so far failed to do so. The reactionary legislation comes on the heels of the governor’s release of his proposed budget, which deals out serious attacks on public education, the poor, and the elderly. The budget includes a $300 million, or 13%, cut to the University of Wisconsin system, the largest single cut of state funding in the university’s history, and restructures the system as a “public authority” that will have unlimited power to raise tuition. The budget also cuts funding for public broadcasting by $10 million, cuts prescription drug coverage for seniors by $15 million, removes the cap on enrollment in the state’s school voucher program that gives public money to private and religious schools, decimates the science arm of the state’s environmental regulatory agency, and requires drug testing of unemployment benefits recipients. As Walker signed the Right-To-Work bill surrounded by the state’s bourgeoisie, about 2000 high school students from across Madison walked out to protest the police shooting of Tony Robinson, an unarmed Black 19-year-old who was killed here on March 6. Officer Matthew Kenny shot Robinson five times after breaking into the house Robinson was in. The young man had been reported jumping in and out of traffic on the street outside. Police barred Robinson’s mother from entering his hospital room to see him before he died; this was explained on the grounds that his body was “evidence.” In the meantime, the cops held two of his friends for four hours for questioning and denied them the opportunity to have an attorney present, though one asked to be let in to see them. Hundreds marched the following day from the local jail to the shooting location, where they confronted a line of police guarding the house, which still had Robinson’s blood visible on the back steps. On March 9, thousands of young protesters gathered at the state capitol and marched to the City-County Building, where they confronted the mayor and demanded Kenny be charged in the death. On March 11, another protest of 2000-3000 began at the state Department of Corrections and ended at the Governor’s Mansion. Each protest has blocked major traffic arteries. 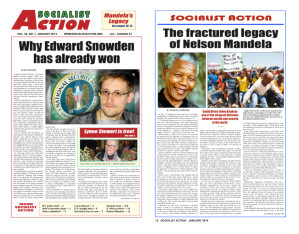 A complete article on the evolving Black Lives Matter protests will be included in the next issue of Socialist Action.